What is Dustless Media Blasting? 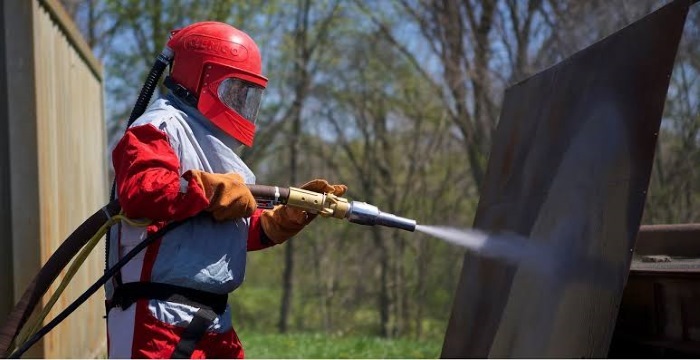 Dustless Blasting is a water-based blasting technique that uses dustless blast pots. It was developed as a result of increasing constraints in health and safety, removing grease, salt and oil, and eliminating sulphates, chlorides, nitrates and phosphates when paired with an abrasive. The dustless blasting technique involves combining water with an abrasive, such as sand or glass, in a tank. This, of course, depends on the material that requires blasting and the depth at which the material must be blasted, such as with concrete sandblasting. In this way, the blasting method removes up to 95% of dust particles; making it the most economic-friendly dust control system. Using high pressure, the water together with the abrasive is then blasted against the surface that requires restoration and any debris falls to the ground. This process, therefore, eliminates all toxic airborne particles, as well as uses less material for cleaning. There are some key benefits to using dustless blasting rather than traditional sandblasting procedures. Statistically, dust is one of the leading causes of a disease called ‘silicosis’. With the media used for dustless blasting being wet, dust particles do not become airborne during the blasting procedure as the abrasive media gets trapped in water and becomes grounded. Dustless blasting is, therefore, the cleanest and safest abrasive blasting procedure for surface preparation. Dustless blasters are able to strip a car in just under 2 hours and do not alter the shape of thin materials due to reduced friction. The setting up of containment is also not required; saving you time as well. It is also more cost-effective than conventional sandblasting, as there is less abrasive blasting material required to complete the blasting job. The dustless blaster is able to hold almost any type of abrasive that sinks in water. Dustless blasting is a practical way to prepare your surface for further restoration, especially if you are planning to add a coat of paint over the material. With dustless blasting, the rust inhibitor decontaminates the metal. The result is a chloride-free, paint-ready surface.